Unless you’re one of the few people who regularly uses their PlayStation Vita, chances are you missed Metrico when it originally debuted on Sony’s flagging portable system back in 2014. I certainly did. But as with most once Vita-exclusive games, it’s now made its way to other platforms with a slightly new name, giving everyone another chance at seeing what the game’s all about. It’s a good thing too because Metrico+ is pretty cool. Metrico+ is a side-scrolling platformer set in a world made of infographics wherein you manipulate the environment through a variety of inventive, if obfuscated, means. Blocks rise and lower as you move left and right, while others slide closer or further away from you with each jump you make. Every action you make affects the world in some way. Figuring out what actions do what is part of the puzzle, as while the general toolset remains the same throughout, no one piece of geometry behaves the same between puzzles. A platform that moves an x-axis in one puzzle, for instance, won’t be governed by the same mechanism the next time you see one. It might move closer to you when you move to the left and farther when you move to the right, only to move in one direction when you stand on a pressure plate and move in the other when you step off it. None of the geometry is controlled through any particularly complex means, though figuring out what you need to do can be difficult sometimes. Every time I got stuck, it was almost always due to not knowing how to operate a specific piece of the level. It’s easy to work out what inputs do and don’t affect the infographics when you’re limited to just a few abilities early on, but by the end, when you’re able to shoot, teleport, reflect bullets, and more, it’s tough to keep it all straight. More annoying, however, is how the game isn’t forthcoming with how to use each new ability you earn. I only ever figured that out either by stumbling into it by chance or by waiting long enough for Metrico to throw a button prompt on the screen. The visual style changes with each world, some more drastically than others. 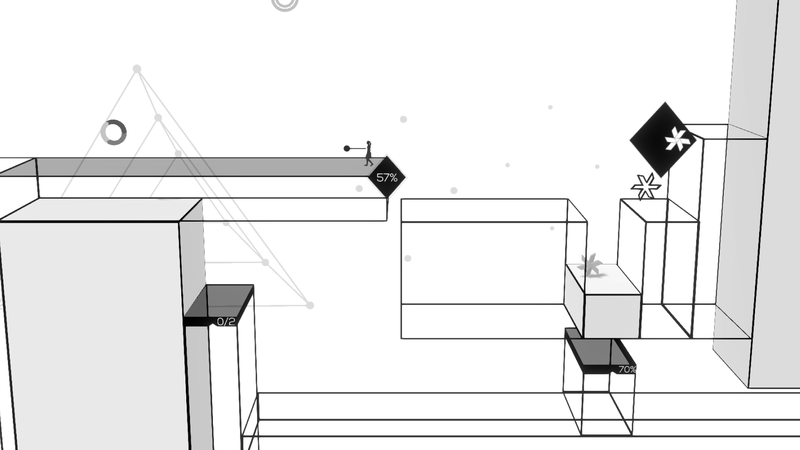 Once you get properly acquainted, however, the act of solving Metrico’s puzzles proves to be very satisfying. Going from being utterly stumped on where to even begin to suddenly piecing together the perfect solution is a feeling all puzzle games strive for, but few capture it with the same frequency as Metrico. Almost every time I solved something, I was remarking on how clever it was. It’s full of those “aha!” moments that make a good puzzle work, and only gets better as they become more intricate. The game gets a lot of mileage out of its relatively simple toolset. Constantly reshaping old ideas helps make each puzzle unique, such that when you see a familiar concept arise it still feels fresh because of how careful Metrico is to avoid reusing the exact same ideas. I never suffered from any of the usual fatigue that settles in from puzzles stagnating here. By the end of each world I wasn’t tired of its tricks and longing for a change, but instead excited to see what was next, even if I’d just finished a particularly difficult section I’d been stuck on for a while. Most puzzle games tend to hit a low point pretty quickly, where things stall and you don’t really want to continue banging your head against whatever problem you’re stuck solving. And while Metrico+ isn’t immune to that, the overall experience seldom fell into that rut. That alone is a pretty notable achievement.